The plan was simple. 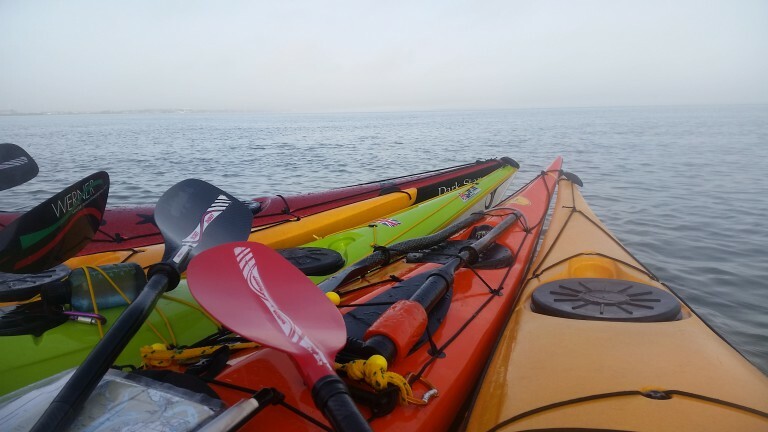 The chance to experience the kayak from a different perspective. To escape from the confines of the river and head out into the great wide open. To smell the salty air. To see the horizon as the Earth curves away from us. 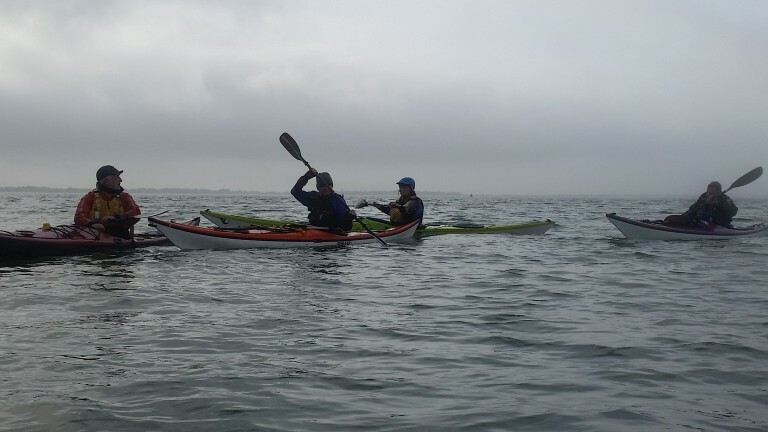 To experience the sea from a sea kayak. We set out from the Southeast extreme corner of Portsmouth at Port Cumberland. Sandwiches and flasks of tea stowed in the ample hulls of our long sea boats we set off onto the calm waters of the bay. The overcast quickly gave way to the warm rays of the sun and as he shone down on us from above we enjoyed learning a little about the maritime ways and customs of the sea. 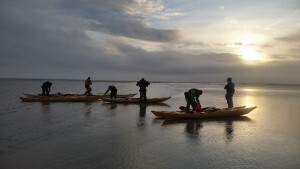 The inward tide carried us along at a good pace making for a relaxing paddle towards the mainland. The buoys drifted past us; or rather we drifted past them. On the open expanse of the estuary it was hard to tell. It is easy to become disorientated out here. 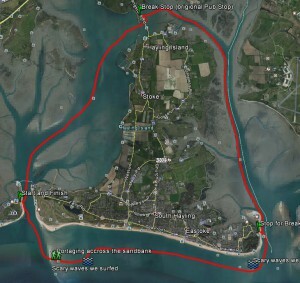 The plan was to stop for lunch at the pub at Langstone then head back the way we came but the good weather enticed us on to venture further out and try for a full circumnavigation of the island. Those of us new to this were unsure but nothing ventured is a loss too big to contemplate with the chance to really achieve something so in very good hands and spirits we set off feeling a little unsure but eager to explore. As we head for the lifeboat station on the corner of Hayling Island the wind picked up. Calm flat waters started to give way to high swells. We stopped for a short break by the lifeboat house and walked around the corner. White water and powerful surf created a tension and apprehension among those of us new to the sea. We contemplated and as we stalled the waters began to calm slightly. Thus we again headed out onto the open sea. Navigating between the surf we cheated the waves as we wove and zigzagged in between, riding the swells that followed. On calmer waters again we felt relieved but the sea was to have the last word. We battled along the south coast of the island. 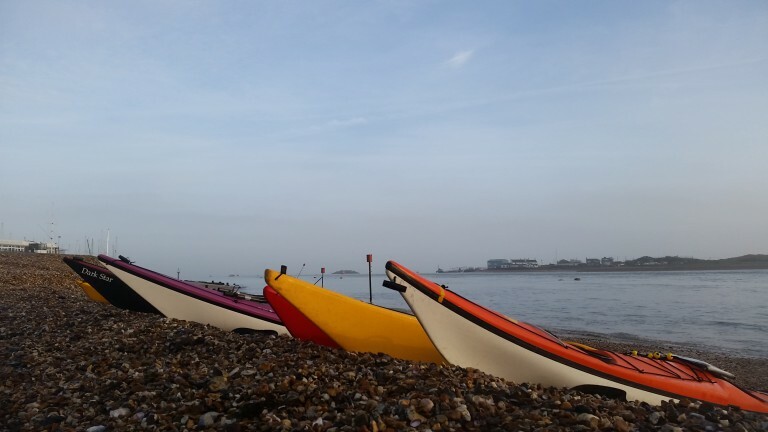 St Helens was watching us from The Isle of Wight as we slowly paddled along, our arms beginning to ache and complain; there was no stopping as the high but gentle swells turned into gnarly surf at the beach – we had no choice but to remain away from shore and press on. Quitting was not an option. We approached the south west corner of the island but the sea can be cruel. Our destination was in sight but a giant sand bank was in our way. We began to head out to sea and around the mass of sand and with no say in the matter this time we had to face the surf and the white water full on. The surf grew more intense. The sea boats, if they had a soul would have been grinning from ear to ear. They were in their domain, bobbing over the surf as it crashed into us like corks on the ripples of a pond. We rode through them and over them as they played with us like colourful toys. The sky of mixed blue and overcast began to give way to dimmer late afternoon hues of grey and with everyone feeling the toll we decided that we would not make it completely around the sand. The surf was bearing its teeth at us and the sun was getting ready for bed. Our best option now was to portage our heavy sea boats across the expanse of sand to reach the other side. Teamwork, moving the boats in stages a few yards at a time we shifted them forwards to reach the other side.